Neurons are organized in local microdomains characterized by morphological and functional specificities. Distinct microdomains include dendritic spines and synapses, which play a major role in neuronal communication by mediating transmission of signals across the synaptic cleft. Synaptic transmission involves flow of ionic currents through surface receptors located on the post-synaptic terminal, and further activation of voltage- and gated ion channels. But How synaptic current modulates and regulates the local voltage remains difficult to study due to the lack of specific sensors and the theoretical hurdle of understanding the dynamics of charged particles in shaped geometrical domains. We study electro-diffusion in cellular microdomains and in particular to address the role of the local geometry of microdomains such as the dendritic spines in modulating synaptic transmission and plasticity. This research combines modeling and simulations of electro-diffusion with multiscale imaging data to analyze the voltage-current relationship in neuronal micro-domains. Experimental imaging data are collected from genetically encoded voltage sensitive dyes in pyramidal neurons in cultures and slices and the model will be finally tested with ultrastructural reconstructions. Dendritic spines, the locus of excitatory synaptic interaction in central neurons constitutes a unique intracellular calcium compartment, in that it can raise Ca to levels higher than those of the parent dendrite. A transient rise of internal calcium can bring about a fast twitch of dendritic spines, the function of which is still unclear. We have proposed (19-20) an explanation of the cause and effect of the twitching and its role in the functioning of the spine as a fast calcium compartment. The dimension of a dendritic Spine is such that this structure is at an intermediate scale between the discreet and the continuum. Thus new approaches are needed to model processes occuring at this scale, such as the induction of synaptic plasticity, which underlies learning and memory. Traditional chemical kinetics may be inappropriate to describe chemical reactions in micro-domains involving only a small number of substrate and reactant molecules. Starting with the stochastic dynamics of the molecules, we have derived a master-diffusion equation for the joint probability density of a mobile reactant and the number of bound substrate in a confined domain. We used the equation to calculate the fluctuations in the number of bound substrate molecules as a function of initial reactant concentration. 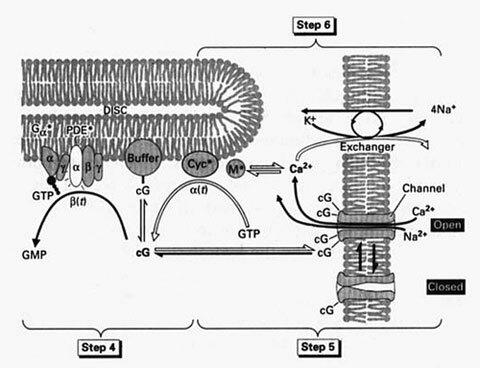 This model can be used for the description of noise due to gating of ionic channels by random binding and unbinding of ligands in biological sensor cells, such as olfactorycilia, photo-receptors, hair cells in the cochlea. The goal of our research is to model the function of sensor cells from a molecular level. We are currently studying how photoreceptors respond to light. This project requires the modeling of various molecular pathways that determine the physiological conditions under which the cells operate with and without light. Following many studies, we have proposed in the past, a mathematical approach to describe stochastic chemical reactions inside a cell, to quantify the level of the noise and to determine the time course of the photon-response in both cones and rods. Ultimately we wish to explain in what sense cones are noisier than rods, and determine the gain amplification generate by a single photon. This research is not only challenging from a biological perspective but also mathematically, because it requires new analysis. We are interested in how a cone can detect several photons and how the molecular response is amplified. More generally, we are interested in deriving from a molecular level the physiology of sensor cells. This includes olfactory cells, hair cells,… Another related goal is to elucidate the mechanism of adaptation in cones. This research involves the modeling of chemical reactions in photoreceptors, stochastic equations, partial differential equations, computer simulations, analysis….anything we need to solve the problem. 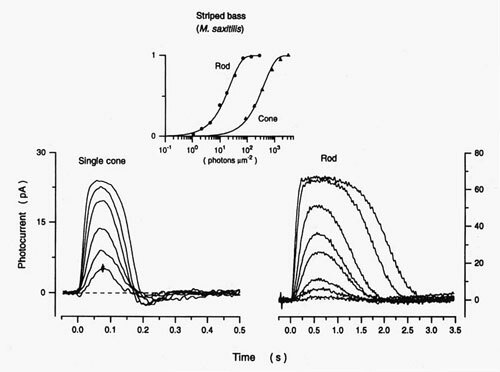 Rods and cones photoreceptors respond to light by an hyperpolarization of the membrane potential. The signal modulated the synapse of the photoreceptors only when the it produces a change in membrane current, that exceeds a certain threshold. Thus this threshold is a fundamental characteristic of the phototransduction process, defined as the amplitude of the spontaneous membrane current and is referred as the ``dark noise’’. Dark noise has been studied in cones and rods and it has been demonstrated that cones are much noisier in dark (absence of any light) than rods, since the amplitude of the noise is about 0.03pA in rods (in primates) while it is 0 .12 pA in cones. As a consequence, a single photon is detectable by a rod whereas at least 5 to 8 are needed to produce a response in cones. For this reason rods appear to be the ultimate sensitive cell detector that responds to a single photon. D. Holcman J. Korenbrot, The limit of photoreceptor sensitivity; molecular mechanisms of dark current noise in retinal, J Gen Physiol. 2005,125(6):641-60. 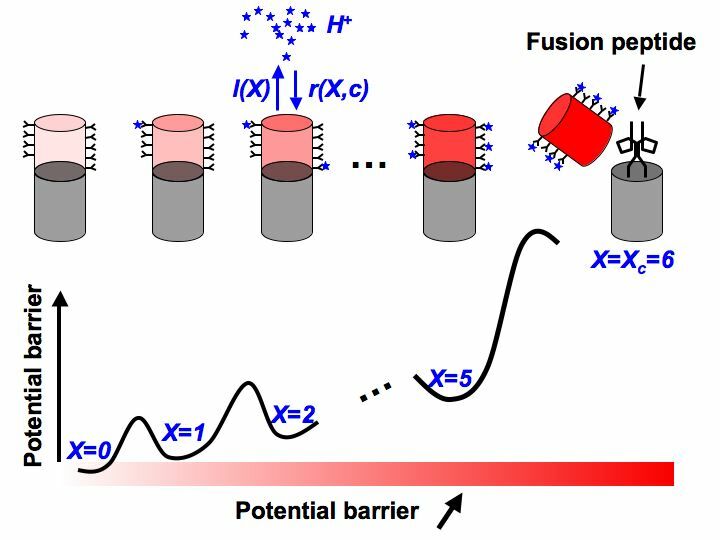 J Reingruber, D Holcman, GL Fain, How rods respond to single photons: Key adaptations of a G‐protein cascade that enable vision at the physical limit of perception, BioEssays 37 (11), 1243-1252 2015. Our group is interested in neurite growth, which is a fundamental step of neuronal development. To study neurite outgrowth, we constructed a model based on vesicle trafficking and microtubule dynamics. In our model, neurite growth is induced by vesicular delivery of membrane at the leading edge of the neurite. We find that neurite growth occurs into two main phases: one early phase characterized by the absence of microtubules in the nascent neurite, while in the second phase, microtubules interact with vesicles. The first phase is initiated by vesicular delivery at the neurite base. During the second phase, the coupling between vesicles and microtubule dynamics can give rise to various growth regimes, dominated by fast or slow transition between growing and shrinking. Microtubule dynamics plays a major role in neurite stabilization, especially during the transition between an initial neuritic protrusion (phase 1) and a long neurite leading to dendrites or axons (phase 2). The different regimes in phase 2 can characterize dendritic and axonal growth in normal, and pathological conditions or during regeneration. Small ensemble of neurons might process information in a very efficient way. We have modeled the emergence of the Up and Down states occurring in cortical neurons. Up and Down states are presented experimentally as a fluctuation of the membrane potential between two stages. The origin of such phenomena is still unknown. To identify the Up-state dynamics we have derived a stochastic dynamical system, modeling the neural network interconnected by excitatory synapses, where depression can occur. The model reveals that there exists a certain threshold for the total synaptic connection strength: when it is reached, the dynamical system has exactly two attractors, interpreted as an Up and Down state. In that case, the transition between the states is due to the synaptic noise. The analysis reveals that the transitions between the states are not symmetric. Moreover an external stimuli increases the time spent in the Up state, as observed experimentally. The Up and Down state is thus a fundamental and inherent property of a noisy neural ensemble, with sufficient synaptic connection. The analysis and the simulations of the equations reveals that the noise is able to drive the dynamics (Voltage) from the Up to the down state and conversely, as described in the following figure below (upper curve). The second figure corresponds to the depression dynamics. E. Bart, S. Bao, D. Holcman. Modeling the spontaneous activity in the auditory cortex, of Computational Neuroscience,2004. In pluricellular organisms, metazoans and metaphytes, positional information is instrumental to all developmental processes. In the nervous system, positional information is responsible for the formation of borders in the developing neuroepithelium and is used for axonal guidance and synapse formation. We are interested here in the main mechanisms by which the position of a cell is defined within an ensemble and how this cell can respond to this information by the expression of a developmental program. This question of morphogenetic fields and gradients has been explored by many theoreticians and experimentalists and the model that we propose present similarities with many anterior ones, in particular those developed by Turing. We recently proposed a model of morphogenetic gradient during early development, based on the propagation of a morphogen, which is a transcription factor. We derived a system of couple degenerated parabolic PDE. We studied how a random perturbation of the gradient can affect the precise location of the boundary between two morphogenetic regions. Modification of the boundary can have dramatic consequences on the position of cortical area and thus on the behavior. D. Holcman V. Kasatkin A. Prochiantz,, Mathematical analysis of morphogenetic gradients stability J. Theor. Biol 2007. Most viruses enter the cell through an endocytic pathway and subsequently travel through the cytoplasm inside an endosomal compartment. To pursue their fate, these viruses have to escape endosomes and deliver their genetic payload in the cytoplasm before being degraded. These methods allow us to estimate the time for the glycoproteins involved in membrane fusion, to change conformation and reach their fusogenic state, leading to fusion and viral escape. This approach is illustrated with enveloped (influenza) and non-enveloped viruses (Adeno-Associated Virus). Finally, using our modeling approach, we were able to analyze single particle data and we could now discriminate bindings from crowding in cytoplasmic viral trajectories (coll. C. Sieben and A. Herrmann, Berlin). It remains many challenges in cellular trafficking that viruses are teaching us: the Virus-host interaction remains a fundamental challenge for us to study. 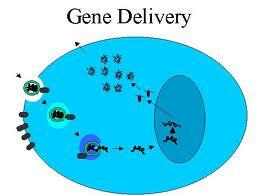 Legends: Scheme of the gene delivery process: we are currently quantifying the first steps of cytoplasmic trafficking. Legends: Nonlinear interaction of HA sites. T. Lagache, C Sieben, A Hermann, D. Holcman, Part I : Modeling the endosomal escape for enveloped viruses. T. Lagache, O. Danos, D. Holcman : Modeling the endosomal step of non-enveloped viruses in cell infection, BJ 2012. T. Lagache E. Dauty D. Holcman, Physical principles and models describing intracellular virus particle dynamics, Current Opinion in Microbiology, 12,4 (2009). Collaboration (D. Ron and E. Avezov, Cambridge UK). A large number of single particle trajectories (SPTs) can now be recorded directly by super-resolution microscopy in cellular environment. The exploration of this environment at an unprecedented nanometer scale opened a new area of science (Nobel 2014 in chemistry). Although the intracellular dynamics can be explored by flows of trajectories, their analysis and interpretation remain a difficult task, because in most cases, the nature of the physical motion and of the local environment, in which trajectories are acquired, are unknown. 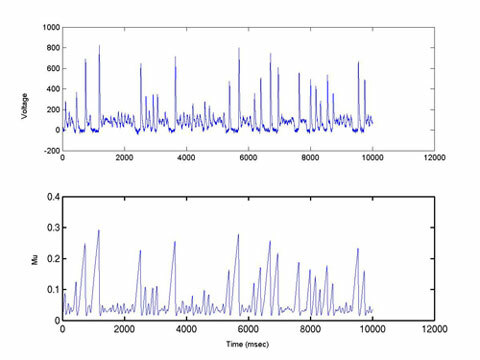 Such analysis involves several steps: deconvolution of the signal, physical models to interpret the recorded motion, derivation of optimal estimators of physical parameters, asymptotic analysis of the model equations to explore the parameter space, simulations of the model stochastic equations on a long time scale, and the extraction of features hidden in the data. Our aim is to develop a new theoretical tools to data analysis of SPTs, based on physical models of molecular diffusion and electro-diffusion, to develop singular perturbation methods for the asymptotic analysis of the model equations and multiscale stochastic simulations for the extraction of information from nano- to micro-cellular compartments. We are applying the methods to the study of two- and three-dimensional motion of proteins, channels, and chromatin loci in their respectively native sub-cellular environment. This allow to probe precisely the pre- and post-synaptic terminals of neuronal cells, the refined endoplasmic reticulum network, made of connected narrow tubes, the cell nucleus, and more. Although these sub-compartments are not physically related, still, the theoretical modeling involved is related and can be used to confirm the broad applicability of the proposed approach. The output of this research is new models, analysis, simulations methods, and algorithms for the extraction of information from large data of SPTs, which can reveal hidden structures below the diffraction limit of the recording apparatus. The representation of big data in concise geometry, by extracting underlying structures, such as high dimensional manifolds, is a key to the extraction of new features. The proposed approach is expected to the emergence of new physical concepts and theoretical methods for the understanding of basic cell properties.